The submicroscopic ground cell substance, or cytoplasmatic matrix which remains after exclusion the cell organelles and particles is groundplasm. It is the hyaloplasm of light microscopy, and high complex, polyphasic system in which all of resolvable cytoplasmic elements of are suspended, including the larger organelles such as the ribosomes, mitochondria, the plant plastids, lipid droplets, and vacuoles. Most cellular activities take place within the cytoplasm, such as many metabolic pathways including glycolysis, and processes such as cell division. The concentrated inner area is called the endoplasm and the outer layer is called the cell cortex or the ectoplasm. Movement of calcium ions in and out of the cytoplasm is a signaling activity for metabolic processes. In plants, movement of the cytoplasm around vacuoles is known as cytoplasmic streaming. The term was introduced by Rudolf von Kölliker in 1863, originally as a synonym for protoplasm, but later it has come to mean the cell substance and organelles outside the nucleus. There has been certain disagreement on the definition of cytoplasm, as some authors prefer to exclude from it some organelles, especially the vacuoles and sometimes the plastids. The physical properties of the cytoplasm have been contested in recent years. It remains uncertain how the varied components of the cytoplasm interact to allow movement of particles[clarification needed] and organelles while maintaining the cell’s structure. The flow of cytoplasmic components plays an important role in many cellular functions which are dependent on the permeability of the cytoplasm. An example of such function is cell signalling, a process which is dependent on the manner in which signaling molecules are allowed to diffuse across the cell. While small signaling molecules like calcium ions are able to diffuse with ease, larger molecules and subcellular structures often require aid in moving through the cytoplasm. The irregular dynamics of such particles have given rise to various theories on the nature of the cytoplasm. There has long been evidence that the cytoplasm behaves like a sol-gel. It is thought that the component molecules and structures of the cytoplasm behave at times like a disordered colloidal solution (sol) and at other times like an integrated network, forming a solid mass (gel). This theory thus proposes that the cytoplasm exists in distinct fluid and solid phases depending on the level of interaction between cytoplasmic components, which may explain the differential dynamics of different particles observed moving through the cytoplasm. Recently it has been proposed that the cytoplasm behaves like a glass-forming liquid approaching the glass transition. In this theory, the greater the concentration of cytoplasmic components, the less the cytoplasm behaves like a liquid and the more it behaves as a solid glass, freezing larger cytoplasmic components in place (it is thought that the cell's metabolic activity is able to fluidize the cytoplasm to allow the movement of such larger cytoplasmic components). A cell's ability to vitrify in the absence of metabolic activity, as in dormant periods, may be beneficial as a defence strategy. A solid glass cytoplasm would freeze subcellular structures in place, preventing damage, while allowing the transmission of very small proteins and metabolites, helping to kickstart growth upon the cell's revival from dormancy. There has been research examining the motion of cytoplasmic particles independent of the nature of the cytoplasm. In such an alternative approach, the aggregate random forces within the cell caused by motor proteins explain the non-Brownian motion of cytoplasmic constituents. The three major elements of the cytoplasm are the cytosol, organelles and inclusions. The cytosol is the portion of the cytoplasm not contained within membrane-bound organelles. Cytosol makes up about 70% of the cell volume and is a complex mixture of cytoskeleton filaments, dissolved molecules, and water. The cytosol's filaments include the protein filaments such as actin filaments and microtubules that make up the cytoskeleton, as well as soluble proteins and small structures such as ribosomes, proteasomes, and the mysterious vault complexes. The inner, granular and more fluid portion of the cytoplasm is referred to as endoplasm. Due to this network of fibres and high concentrations of dissolved macromolecules, such as proteins, an effect called macromolecular crowding occurs and the cytosol does not act as an ideal solution. This crowding effect alters how the components of the cytosol interact with each other. Organelles (literally "little organs"), are usually membrane-bound structures inside the cell that have specific functions. 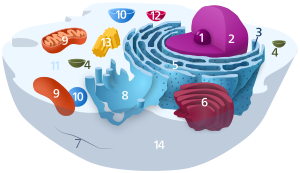 Some major organelles that are suspended in the cytosol are the mitochondria, the endoplasmic reticulum, the Golgi apparatus, vacuoles, lysosomes, and in plant cells, chloroplasts. The inclusions are small particles of insoluble substances suspended in the cytosol. A huge range of inclusions exist in different cell types, and range from crystals of calcium oxalate or silicon dioxide in plants, to granules of energy-storage materials such as starch, glycogen, or polyhydroxybutyrate. A particularly widespread example are lipid droplets, which are spherical droplets composed of lipids and proteins that are used in both prokaryotes and eukaryotes as a way of storing lipids such as fatty acids and sterols. Lipid droplets make up much of the volume of adipocytes, which are specialized lipid-storage cells, but they are also found in a range of other cell types. The cytoplasm, mitochondria and most organelles are contributions to the cell from the maternal gamete. Contrary to the older information that disregards any notion of the cytoplasm being active, new research has shown it to be in control of movement and flow of nutrients in and out of the cell by viscoplastic behavior and a measure of the reciprocal rate of bond breakage within the cytoplasmic network. The material properties of the cytoplasm remain an ongoing investigation. Recent measurements using force spectrum microscopy reveal that the cytoplasm can be likened to an elastic solid, rather than a viscoelastic fluid. ^ Shepherd, V. A. (2006). The cytomatrix as a cooperative system of macromolecular and water networks. Current Topics in Developmental Biology. 75. pp. 171–223. doi:10.1016/S0070-2153(06)75006-2. ISBN 9780121531751. PMID 16984813. ^ Hogan, C. Michael (2010). "Calcium" Archived 12 June 2012 at the Wayback Machine in Encyclopedia of Earth. A. Jorgensen, C. Cleveland (eds.). National Council for Science and the Environment. ^ Kölliker, R. A. v. (1863). Handbuch der Gewebelehre des Menschen. 4. Auflage. Leipzig: Wilhelm Engelmann. ^ Bynum, W. F., Browne, E. J. and Porter, Ray (1981). Dictionary of the history of science. Princeton University Press. ^ Parker, J. (1972). "Protoplasmic resistance to water deficits", pp. 125–176 in Kozlowski, T. T. (ed. ), Water deficits and plant growth. Vol. III. Plant responses and control of water balance. Academic Press, New York, p. 144, . ^ Strasburger, E. (1882). "Ueber den Theilungsvorgang der Zellkerne und das Verhältnis der Kernteilung zur Zellteilung". Arch Mikr Anat. 21: 476–590. Archived from the original on 27 August 2017. ^ Cowan AE, Moraru II, Schaff JC, Slepchenko BM, Loew LM (2012). Spatial Modeling of Cell Signaling Networks. Methods in Cell Biology. 110. pp. 195–221. doi:10.1016/B978-0-12-388403-9.00008-4. ISBN 9780123884039. PMC 3519356. PMID 22482950. ^ Holcman, David; Korenbrot, Juan I. (2004). "Longitudinal Diffusion in Retinal Rod and Cone Outer Segment Cytoplasm: The Consequence of Cell Structure". Biophysical Journal. 86 (4): 2566–2582. Bibcode:2004BpJ....86.2566H. doi:10.1016/S0006-3495(04)74312-X. PMC 1304104. PMID 15041693. ^ a b c d Parry, Bradley R.; Surovtsev, Ivan V.; Cabeen, Matthew T.; o'Hern, Corey S.; Dufresne, Eric R.; Jacobs-Wagner, Christine (2014). "The Bacterial Cytoplasm Has Glass-like Properties and is Fluidized by Metabolic Activity". Cell. 156 (1–2): 183–94. doi:10.1016/j.cell.2013.11.028. PMC 3956598. PMID 24361104. ^ Taylor, C. V. (1923). "The contractile vacuole in Euplotes: An example of the sol-gel reversibility of cytoplasm". Journal of Experimental Zoology. 37 (3): 259–289. doi:10.1002/jez.1400370302. ^ Guo, Ming; Ehrlicher, Allen J.; Jensen, Mikkel H.; Renz, Malte; Moore, Jeffrey R.; Goldman, Robert D.; Lippincott-Schwartz, Jennifer; MacKintosh, Frederick C.; Weitz, David A. (2014). "Probing the Stochastic, Motor-Driven Properties of the Cytoplasm Using Force Spectrum Microscopy". Cell. 158 (4): 822–32. doi:10.1016/j.cell.2014.06.051. PMC 4183065. PMID 25126787. ^ van Zon A, Mossink MH, Scheper RJ, Sonneveld P, Wiemer EA (September 2003). "The vault complex". Cell. Mol. Life Sci. 60 (9): 1828–37. doi:10.1007/s00018-003-3030-y. PMID 14523546. ^ Prychid, Christina J.; Rudall, Paula J. (1999). "Calcium Oxalate Crystals in Monocotyledons: A Review of their Structure and Systematics" (PDF). Annals of Botany. 84 (6): 725–739. doi:10.1006/anbo.1999.0975. ^ Prychid, C. J.; Rudall, P. J.; Gregory, M. (2004). "Systematics and Biology of Silica Bodies in Monocotyledons". The Botanical Review. 69 (4): 377–440. doi:10.1663/0006-8101(2004)069[0377:SABOSB]2.0.CO;2. JSTOR 4354467. ^ Ball SG, Morell MK (2003). "From bacterial glycogen to starch: understanding the biogenesis of the plant starch granule". Annu Rev Plant Biol. 54: 207–33. doi:10.1146/annurev.arplant.54.031902.134927. PMID 14502990. ^ Shearer J, Graham TE (April 2002). "New perspectives on the storage and organization of muscle glycogen". Can J Appl Physiol. 27 (2): 179–203. doi:10.1139/h02-012. PMID 12179957. ^ Anderson AJ, Dawes EA (1 December 1990). "Occurrence, metabolism, metabolic role, and industrial uses of bacterial polyhydroxyalkanoates". Microbiol. Rev. 54 (4): 450–72. PMC 372789. PMID 2087222. ^ Murphy DJ (September 2001). "The biogenesis and functions of lipid bodies in animals, growth and microorganisms". Prog. Lipid Res. 40 (5): 325–438. doi:10.1016/S0163-7827(01)00013-3. PMID 11470496. ^ Feneberg, Wolfgang; Sackmann, Erich; Westphal, Monika (2001). "Dictyostelium cells' cytoplasm as an active viscoplastic body". European Biophysics Journal. 30 (4): 284–94. doi:10.1007/s002490100135. PMID 11548131. Luby-Phelps K (2000). Cytoarchitecture and physical properties of cytoplasm: volume, viscosity, diffusion, intracellular surface area (PDF). Int Rev Cytol. International Review of Cytology. 192. pp. 189–221. doi:10.1016/S0074-7696(08)60527-6. ISBN 9780123645968. PMID 10553280. This page was last edited on 27 November 2018, at 19:01 (UTC).